Mountain bike legends gathered to salute Trips for Kids (TFK) at the 10th Annual Brews, Bikes and Bucks fundraiser. Among those present at the Feb. 10 event were greats Gary Fisher, Joe Breeze, Charles Kelly, Mert Lawwill, Jacquie Phelan, Ross Shafer, Michael Kelley and Chris Lang. The annual fundraiser, held at the Broken Drum Brewery & Wood Grill in San Rafael, Calif., raised close to $3,000 for the program. The money raised is used to fund mountain biking adventures for at risk kids. "Each year, Broken Drum owner Noah Berry not only opens his doors for the cause, but donates proceeds from the food and drink sales," said Marilyn Price, founder of Trips for Kids. "We are so fortunate and grateful for Noah's continued generosity. This would not be possible without him." Outside the Broken Drum, admirers gawked at the rows of tricked-out mountain bikes lining the sidewalk; inside, pints in hand, the owners of these bikes tell tall tales of traveling on two wheels. TFK supporters had the opportunity to meet and socialize with the pioneers of the mountain bike industry, but the loot inside the bar was also a draw. Impressive bikes and accessories generously donated by the bike industry were raffled throughout the afternoon. The most sought-after prize was a 2007 Jamis Dragon Comp mountain bike. A silent auction was also held for a Muirwoods 29er mountain bike donated by Marin Bikes. For more than twenty years, Trips for Kids has given over 37,000 at-risk youth an opportunity to explore the outdoors on a mountain bike. With the guidance of Founding Director and Mountain Bike Hall of Famer, Marilyn Price, these rides give disadvantaged youth a chance to experience the challenge and joy of mountain biking. There are now fifty eight Trips for Kids coast to coast in the United States and Canada, with more on the way. For more information about Trips for Kids visit http://www.tripsforkids.org or call (415) 458-2986. 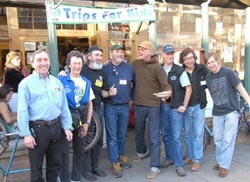 The Trips for Kids Re-Cyclery Bike Thrift Shop is located at 610 Fourth Street, San Rafael, Calif. The shop is open every Tuesday through Friday, 12:00 p.m. to 6:00 p.m. and Saturday and Sunday, 10:00 a.m. to 4:00 p.m. Trips for Kids is a national 501(c)3 nonprofit based in San Rafael, California. Trips for Kids started in 1988 as a grass roots effort by avid mountain biker, environmentalist, and Mountain Bike Hall of Fame inductee, Marilyn Price. Its programs give underserved youth a chance to experience the joy and challenge of mountain biking, while learning valuable life skills and an appreciation for the outdoors. There are currently 57 Trips for Kids chapters across the United Stated and Canada, with more on the way.